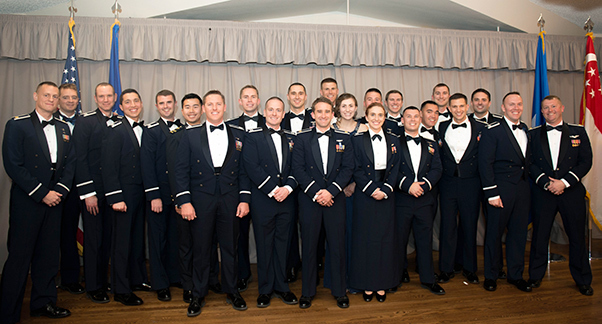 United States Air Force Test Pilot School Class 18A stood proudly before friends, families, base leadership and fellow testers at Club Muroc as they received their Master of Science Degree in Flight Test Engineering Dec. 7, 2018. United States Air Force Test Pilot School Class 18A stood proudly before friends, families, base leadership and fellow testers at Club Muroc at Edwards Air Force Base, Calif., as they received their Master of Science Degree in Flight Test Engineering Dec. 7, 2018. Each graduate crossed the stage to receive the graduate plaque from TPS, the diploma from Air University, the graduate coin and the coveted TPS Graduate patch. The graduation is the culmination of an intense, 48-week program that transforms top operational pilots, navigators and engineers, into elite flight test professionals. 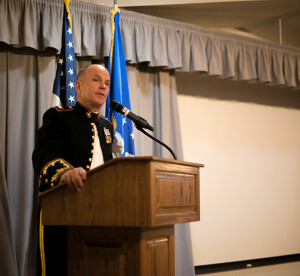 Following the formal dinner, retired U.S. Marine test pilot and NASA astronaut, Col. Frederick Sturckow, went up to the podium as the featured speaker of the evening. Sturckow is a U.S. Air Force Test Pilot School graduate who would be a part of four space shuttle missions. 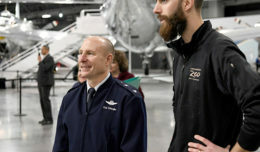 He described one mission to the International Space Station where, along with fellow TPS graduate Col. Kevin Ford, they experienced a problem and had to shut down a thruster. They managed to maneuver their spacecraft to the ISS with only simulator training. “Where did Colonel Ford and I learn to do something never been done in an airplane before? Right here, at the U.S.A.F. Test Pilot School,” Sturckow said. Sturckow advised the new graduates to be humble when they get to their new units and to be prepared to do the “dirty work” as well as the exciting things such as flying test missions. Each student also participated in a Test Management Project during the year in which they planned, executed and reported on data for a Department of Defense customer, according to Col. Ryan Blake, U.S. Air Force Test Pilot School commandant. 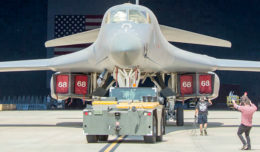 “During a busy and demanding year of training, the students completed over 2,500 graduate hours of instruction, 21 scored academic exams, 85 airborne laboratory events, 38 graded reports and 120 hours of flight time,” said Blake. Class 18A graduates join more than 3,000 alumni including 100-plus general officers and 60 astronauts. Retired U.S. Marine test pilot and NASA astronaut, Col. Frederick Sturckow, was the featured speaker of TPS Class 18A’s graduation ceremony at Club Muroc Dec. 7, 2018. Sturckow is a U.S. Air Force Test Pilot School graduate, four-time space shuttle mission astronaut and commercial spacecraft pilot. Have BASS — The Bay Acoustics Store Separation (BASS) test team demonstrated the expanded envelope of the WAASP pod on the F-16. The pod was used to conduct research on aeroacoustic effects on bay- mounted stores. Have MEDUSA — The Multi-Path Escape Decisions Using Sophisticated Algorithms (MEDUSA) test team evaluated the performance of a ground collision model for performance-limited aircraft. The system under test was integrated onto a Calspan Variable Stability Learjet and predicted five different terrain avoidance maneuvers. Pave DNA — The Pave Distinct Native Attributes (DNA) test team demonstrated the discriminability of received signals using statistical machine learning techniques. The system under test was flown on a C-12 modified with signal reception hardware. Have UPDAWG — The Ultra-High Accuracy Reference System Position Data Acquisition Without Global Positioning System (UPDAWG) test team evaluated the utility of a pod-mounted Ultra High Accuracy Reference System in a GPS-denied environment. The pod was flown on a T-38 supersonic trainer and utilized the White Sands Missile Range (New Mexico).